A small fishing boat swept into the ocean by the 2011 tsunami off the coast of Japan washed ashore two years later in the coastal Northern California town of Crescent City, about 350 miles north of San Francisco. 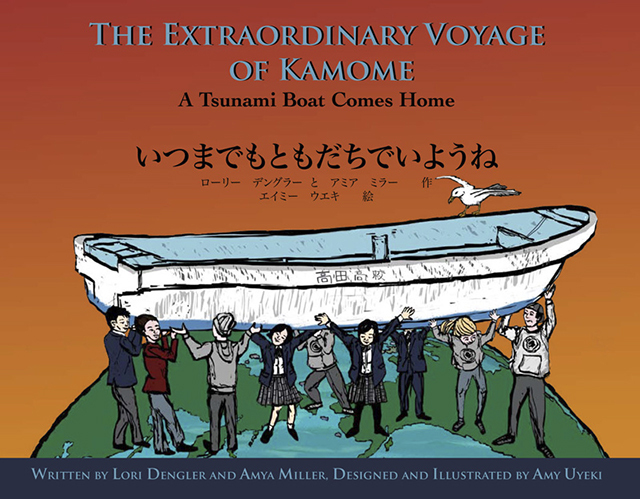 “The Extraordinary Voyage of Kamome: A Tsunami Boat Comes Home,” published by the new Humboldt State University Press, is due out Nov. 5. That boat’s journey here and its return to Japan have been captured in “The Extraordinary Voyage of Kamome: A Tsunami Boat Comes Home,” a new bilingual children’s book by Humboldt State emeritus Geology Professor Lori Dengler and Amya Miller, Special Assistant to the Mayor of Rikuzentakata—a city in Japan destroyed by the tsunami. “This tough little boat that went all the way across the ocean and came back to Japan is a story of survival and hope. And everybody responds to it,” says Dengler. The story begins March 11, 2011, when a 9.0-magnitude earthquake triggered a tsunami that killed more than 20,000 people and devastated more than 300 miles of Japanese coastline. It also swept 5 million tons of debris into the ocean, most of which sank. About 1.5 million tons was carried out to sea. Included in that debris: a small fiberglass boat that was swept into the North Pacific Gyre—a slow rotating current and home to the world’s largest ecosystem. There, the boat drifted forward, sometimes backward and sometimes in a loop, getting caught in the vast swath of other debris in Great Pacific garbage patch until April 2013, when it washed ashore in Crescent City on California’s North Coast. Notified of the boat, Dengler traveled with other experts to Crescent City the next morning. When she arrived, she was astounded by what she saw: a vessel covered in gooseneck barnacles, some a foot long. She and her colleagues immediately got to work. All Dengler needed now was confirmation that the boat was from the tsunami. However, the official verification process—which involves the Japan Consulate, the Japanese government and the National Oceanic and Atmospheric Administration—would take several weeks. So she turned to the Rikuzentakata’s Facebook page and posted photos of the boat. Miller, who was the director of global public relations for Rikuzentakata, had been managing the page. An American born and raised in Japan, Miller returned to Japan after the March 2011 earthquake as a volunteer interpreter and never left. For the last two years, she’s been at the helm of Rikuzentakata’s public relations effort, facilitating communications between the city and international media and aid organizations and helping to ensure the city and its people are not forgotten. Miller saw the boat photo on Facebook and later gave Dengler the confirmation she needed. The boat was named “Kamome” (Japanese for seagull). It belonged to Takata High School in Rikuzentakata and was used by students learning how to scuba dive and work in harbors. At the time of the tsunami, Kamome was not in use and had been tied to a platform where it was stored with other boats. Discovery of the boat’s origin set in motion another journey for two groups of high school students—both separated by 5,000 miles of ocean and different cultures, but from tsunami- and earthquake-vulnerable areas. Del Norte High students in Crescent City cleaned the boat and, coordinating with Miller, they raised money to send the boat back to Japan. Kamome returned to the sea, crossing the ocean—this time in a shipping container—and arriving in Rikuzentakata in October, 2013. A small barnacle-encrusted boat, verified later as debris from the 2011 tsunami, washed ashore in Crescent City in 2013. Grateful for the boat’s return, Takata High School students invited the Del Norte High School students to visit Japan and in 2014, six visited Japan in 2014. Rikuzentakata students visited Del Norte High School the following year. The two high schools now have a sister school relationship and plans are currently developing to send another group of Del Norte High students to Japan in 2016. Of the 60 objects officially found in the United States officially confirmed by the Japanese government from the tsunami, Dengler believes the boat may be most important. “It’s one of the few items to be returned and the only piece that was publicly owned. And in Japan, you don’t put on display something privately owned,” she says. Moved by the effort to return the boat and connections between the students, Dengler and Miller began writing a children’s book, and enlisted Arcata artist Amy Uyeki, who was immediately drawn to the project. Uyeki used a technique inspired by Japanese woodblock prints. Her hope was to strike a balance between realism and a sense of whimsy and wonder. “There’s a bit of magic that happens with this story, and I wanted to convey that in the artwork,” she says. The result is a richly illustrated book written in spare Japanese and English prose—aimed at elementary students—that reflects the spirit of survival and friendships. Dengler and Miller also see the book as a way to get children, teachers and parents interested in the science behind ocean processes, earthquake and tsunamis, preparedness, and Japanese and American cultures. The book’s official website, Humboldt.edu/kamome, will eventually include a curriculum. Ultimately, the work symbolizes hope and the resilience of a city of 24,000 that had been left in ruins. The disaster wiped out 90 percent of Rikuzentakata and killed one tenth of its population. About 200 people are still missing. Earlier this year, Kamome was featured in an exhibit at the prestigious Tokyo National Museum, and is now home in Rikuzentakata. As for the city, it’s still in the process of rebuilding as work crews use soil from nearby mountaintops to fill land, and to lay a new foundation. “The Extraordinary Voyage of Kamome: A Tsunami Boat Comes Home,” printed by Bug Press in Arcata, Calif., is the first publication of the new Humboldt State University Press and is currently available at the HSU Bookstore. Proceeds from sales of the book will go to support continued exchanges between the two high schools and to promote earthquake and tsunami preparedness and education. The book’s official release is Thursday, Nov. 5, with a community reception from 5:30 to 7 p.m., in Crescent City at the Crescent Fire Protection District, 255 Washington Blvd. Humboldt State University plans to host a celebration of the new press with readings from the book and presentations by Dengler, Miller, and Uyeki. The Desert Community Foundation provided funds for the initial printing. Each school library and second grade classroom in Humboldt and Del Norte counties will receive a copy of the book, thanks to a grant from the Humboldt Area Foundation’s Mia Bo Fund.